The TOGAF documentation frequently talks about customizing the material to suit the exact needs of your enterprise. In this TOGAF poster our enterprise architecture expert Roger Evernden looks at how you might go about adopting and adapting TOGAF to suit your needs, and relates this to an EA team that is working its way through the various levels of architectural maturity - from the initial level, through under development, defined and managed, to measured. 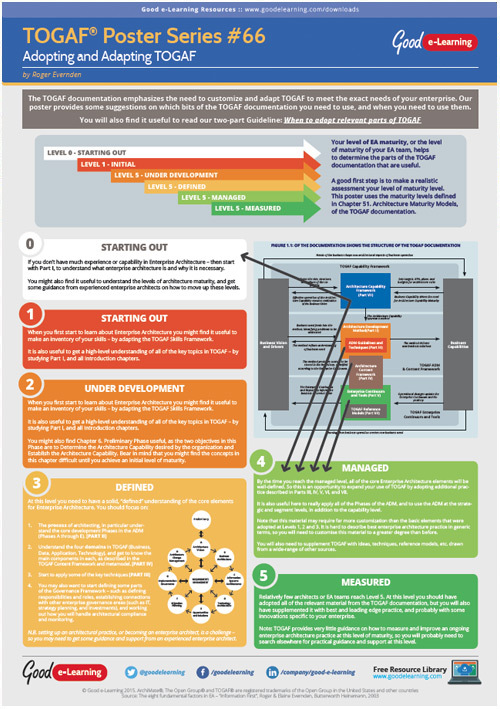 Download this TOGAF learning poster today and you’ll also get instant access to 485+ free business & IT learning resources!